This SoySNP50K iSelect SNP beadchip has 24 etched rectangles, which hold hundreds of thousands of microbeads, allowing detection of more than 50,000 bits of genetic information from a soybean DNA sample. Credit: Peggy Greb. U.S. Department of Agriculture (USDA) researchers in Beltsville, Md. have developed a new tool to search for soybean genes that will make soybean plants more productive and better able to resist pests and diseases. Scientists are constantly searching for genes to breed into soybeans that improve on disease resistance, yields, drought tolerance and other important characteristics. The tool was developed by Agricultural Research Service (ARS) scientists Perry Cregan, Qijian Song and Charles Quigley at the Soybean Genomics and Improvement Laboratory in Beltsville. Using the new tool, scientists can collect genetic information in three days that previously took weeks to gather. 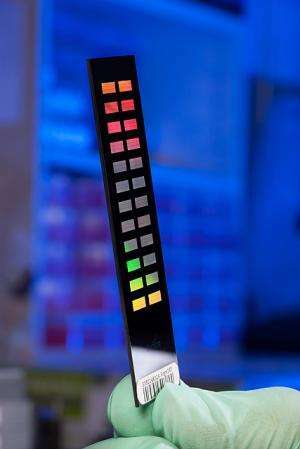 The tool, called the SoySNP50K iSelect SNP BeadChip, is a glass chip about 3 inches long with an etched surface that holds thousands of DNA markers. The markers can be used to characterize the genomes of large numbers of soybean plants. To create it, the researchers analyzed and compared the DNA of six cultivated and two wild soybean plants to identify single nucleotide polymorphisms (SNPs), a commonly used type of molecular marker. They compared SNPs from the eight soybean plants with sequences of a well-known cultivated variety and came up with thousands of gene markers to use as signposts when comparing genes of different soybean plants. The researchers have used the chip to profile 96 wild and 96 cultivated soybean varieties by comparing SNP alleles, or variant forms, at each of their 52,000 positions on the soybean genome, as registered on the chip. They identified regions of the genome that played a key role in the plant's domestication. Their results were published in PLOS One. The researchers also used the chip to analyze the 18,484 cultivated soybean accessions and 1,168 wild soybean accessions in the USDA Soybean Germplasm Collection at Urbana, Ill., and submitted the data to the USDA-ARS soybean genetics and genomics database (known as SoyBase) so it can be accessed by breeders and geneticists. ARS is USDA's principal intramural scientific research agency, and this research supports the USDA priority of promoting international food security.